R6: Wesley So hang on to the lead @ Capablanca Memorial 2014. 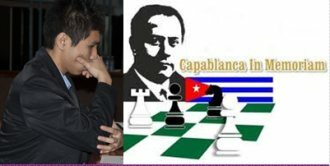 With 4-rounds to go at the prestigious 49th Capablanca Memorial Tournament (2014) being played from 8 to 18 May at the Habana Riviera Hotel in La Havana, Cuba, Filipino GM Wesley So had drawn his R6 match against GM Lazaro Bruzon’s English opening in another exciting, bloody (as described by many kibitzers & mirons online), intense and time pressured game that lasted for about 2hrs & 27min in only 22 moves and scoring 4.0/6 in the process to hang on his half-point lead over the top seed GM Leinier Domínguez Perez who also had drawn his 28-mover match, a Najdorf variation of the Sicilian defense, with the 2nd seed GM Vassily Ivanchuk and scoring 3.5/6. Read full story: R6: Wesley So hang on to the lead @ Capablanca Memorial 2014.